Luggage is a big problem in your trip. A good luggage storage plan can save your time and money. There are some luggage storage choices when you travel in Taiwan. Here is a summary and tips for luggage storage service. Luggage storage is always a big issue in itinerary planning. The information of luggage storage is in pieces. It is hard to find the location of storage center and match to your itinerary plan. 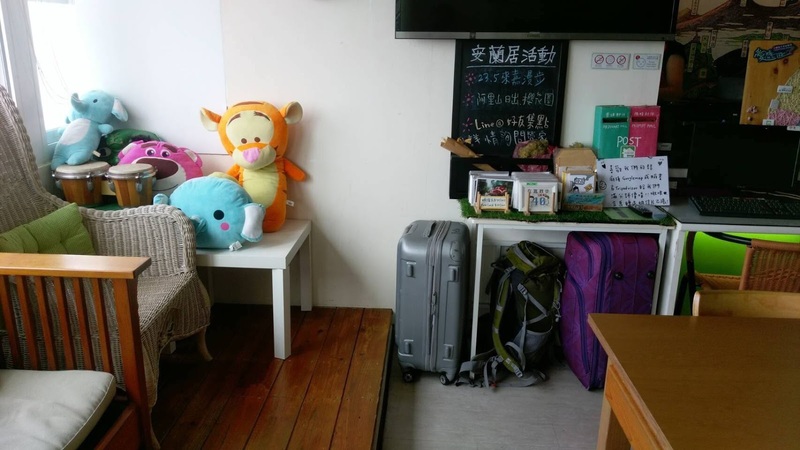 Here is summary of luggage storage in Taiwan that may be useful to your trip. 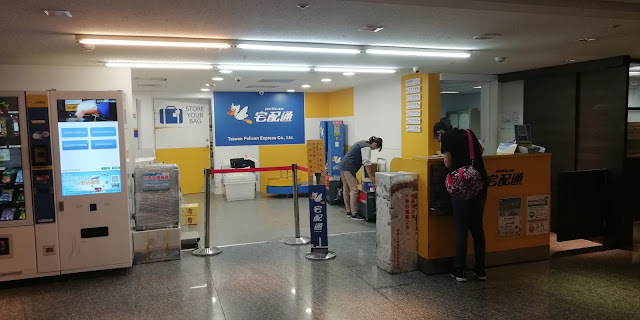 If you only layover at Taiwan for a few hours or a few days and you don't need to bring your luggage with you until leaving Taiwan, you can leave your luggage at Taoyuan airport. Taoyuan airport provides 24 hours luggage service. No matter whenever you arrive Taoyuan airport, you can use the service. There price for the following list is for each time, up to 30 days. Some railway stations provide lockers. If you will go to Taipei Main Station, Taichung Station, Koahsiung Station and come back in a few hours, the locker could be a good choice. However, you should be aware of the problems. The price of lockers is expensive comparing with other storage service. The locker price is on 3-hour base. It count every 3 hour. If you choose a NTD 50 locker and come back after 10 hours, it counts 4 time and you need to pay NTD 200. Another problem with the lockers located at railway station is the number. There are over hundreds of lockers in Taipei Main station(including HSR/MRT TMS). But that's not the case in other stations. There are around 30 lockers in major stations and around 10 big locker that can fit 28 inch luggage. You may need a backup plan if the lockers if full. There are about 100 train stations provide luggage storage service. Most major Railway Stations provide baggage service, including Taipei, Kaoshung , Taichung, Shifeng, Ruifang, Hualine. The following table provides a short list of the 100 train stations, which is nearby some places of interest or transportation center. The storage fee is on a 24h base. The fee is different according to the sum of lengh + width+ heigh of your luggage. 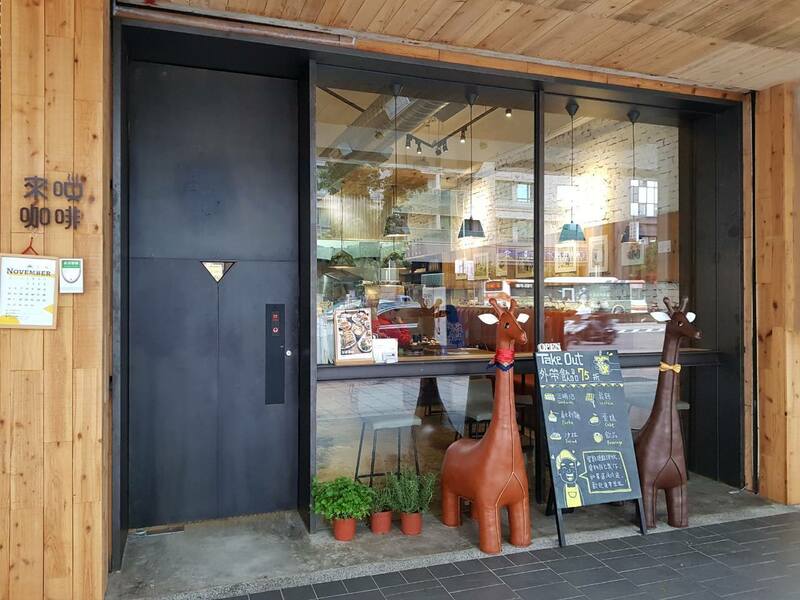 Although the service hour is 8:00~20:00, the fee is cheap comparing with lockers which is on 3-hour base or one-time base and provide only a small box. The Taipei Railway Station Baggage is cheap and convenient for travelers. Here are some tips for using luggage storage center according to my traveling experience around Taiwan. The Taipei Railway Station Baggage Center is not located in Taipei Main Station. It is 50m east of the main building. You can go to the center from East 3 Gate or East 1 Gate of the main building. Taipei Railway Station is the most convenient station in Taipei. There are one railway line, one HSR line, 2 MRT lines and one bus center here. Most of time,the baggage center is full because of its convenience. 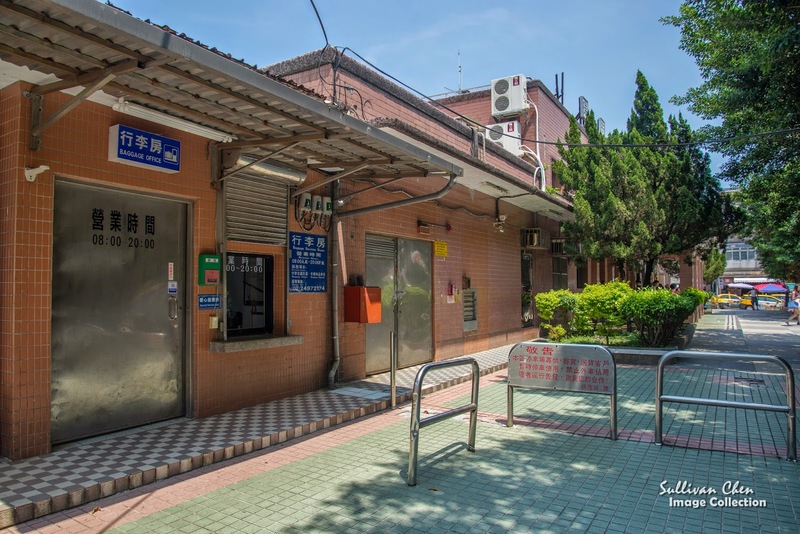 You can use the storage in the next stations, Wanhua Railway Station or Songshan Railway Station. The train to Wanhua and Sonshan Station is only 5~10 minutes. Please make a phone call before you go to the Taipei Railway Station Baggage Center. Tel(02)23141223. 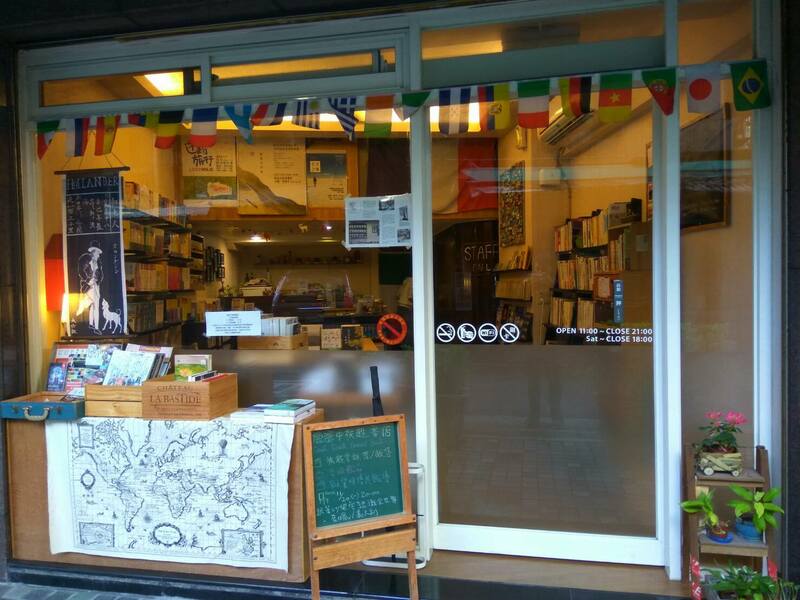 There are also some attractions near Wanhua Station & Songshan Station. Songshan Station: Raohe night market, Wufenpu, Rainbow bridge. Because the interval of Pinxi Railway Line is about 1 hour and the train is always crowded , it is difficult to move with your luggage. Therefore, one-day trip is much convenient. If you have a two-day trip and will stay one night at Jiufen, you can leave your luggage at Luggage Center of Taipei Railway Station/ Songshan Railway Station. Just bring a small backpack with you. Tourism Bureau provides lots visitor centers in major attractions and transportation stations. You can ask for help if you want to leave your luggage for a while. However, most visitor centers close around 5:30 pm. Please remember to retrieve your luggage within service hour. You should also keep in mind that luggage storage serve is not a regular service for a visit center. They can reject to help you. Even they help your but don't have responsibility to keep the safety of your luggage. The first choice of luggage storage for a foreign traveler may be the lockers or storage service center in a transportation hub. However, there are lots problems if you want to use it. * You need to search and confirm the information about whether there is locker or storage service in a transportation one by one in advance. * You need to find the location in a jumbo station.You need to be lucky enough that the locker or storage service is not full. * You need to pray that your luggage can fit the storage space. You need to come back before the service hour. All of the problems mentioned have happened to me and became my nightmare when I travel around the world. You may need to repack your luggage. But it is embarrassing to repack your luggage in open space with lots passengers walking by, especially with underwear inside. You may also hope that you can have a place to take a rest with delicious drink or food if there are a few hours for your train or bus to go. lalalocker is a new business model. You can leave your luggage at cafes, hotels,bookstores, bars. Its price is on daily base. NTD 150 for big luggage with the longest side more than 45 cm and NTD 50 for small luggage. For a foreign traveler, the best advantage of lalalocker is it increases the certainty of your trip. You can book in advance. You can find the location easily by google maps as well. You don't need to worry the size of the lockers. You can also enjoy your trip without worrying the service hour. lalalocker also help your trip in additional to luggage storage service. lalalocker partners also play as a traveling information center. You can get extra free service at the lalalocker stores, e.g. transportation and attractions information, battery charging, WiFi., which are important issues to your itinerary. The service can make your trip more efficient and smoothly. Storage space in one of lalalocker store. Lots partners of lalalocker are feature stores, including local restaurants, cafe, tea house, and etc. It means that you can have more fun at the luggage storage center. Luggage storage center is not only an place to leave your luggage. In additional to luggage storage service, you can also enjoy the service of the shop. The following example is that I search lalalocker stores near MRT Danshui Station. The website provides choices near the station for you and you can book in advance. When I arrive MRT Danshui Station and I open lalalocker with my cell phone, I can locate the store(yellow mark) and myself (blue dot). Since most lalalocker stores are located along streets, it is much easier to find. 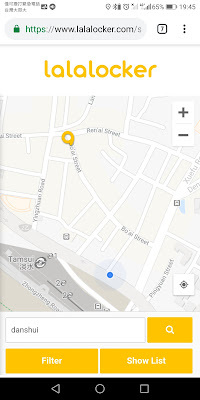 Hi, may I know if it's possible to transport my luggage from taipei main station to keelung? Or is it only possible between stations with a tick at the express delivery column? Also, is there a specific time to pick up the luggage? But most people won't do that. You have take your luggage to the luggage center of Taipei Main Station, then thy arrange a train for your luggage and then you claim your luggage at Keelung Train Station. You may wait another day to claim your luggage. But.. It takes less than 1 hour if you take your luggage with you to Keelung. I'm intending to stay at Sun Moon Lake for a night and come back to Tai Chung the next day. Do you know if it is possible to leave my luggage overnight with the railway station luggage service? You just simply book a pick up and leave your luggage at the hotel reception desk. It is safe and secure. You can read their safety regulations and procedures online. Yes, hotel is the first choice. However, it means you should go back to the hotel. You may deposit it at the bonded luggage counter for collection on departure. The most efficient solution is ask help from the custom after claiming your luggage. Hi, I arrive from USA and I want to store my luggage at Taoyuan Terminal 1 in 9 days, after that, I will go back and take this luggage out of airport, could I do it or must collect on departure back? Hi may i know if its possible to extend the duration for the locker to 2 days? I didn't introduce any locker and the hours of lockers depends on where do you depot. Some lockers, ex in Taipei Main Station, provide 24h service. I would like to store my 28 inch luggage at Taichung HSR Station for 3 hours, where should I proceed to after arrival? How much does it cost? 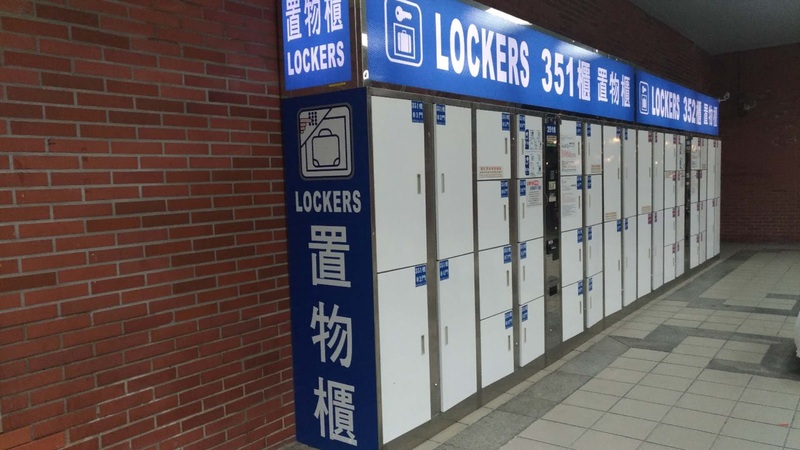 If the lockers cannot satisfy your need or the lockers are occupied , you can take the train to Taichung train station (northbound) or Changhua train station(southbond). Both takes about 10 minutes by train. May I know where are the lockers located at Taichung HSR Station? Can I store luggage over night at chiayi station? How much does it cost and what is the maximum luggage allowance for storage? You can leave your luggage at the luggage center center in Chiayi train station. No size limit if your luggage is a regular case. The cost ranging from NTD 30~70 per day, depending on the size. Hi, what is the size limit to store my luggage at Taipei train station? Is there a room to store luggages of varying sizes? I have luggages bigger than 28" and few big cartons. Thanks. The luggage center is a room. Your luggage won't be a problem. However, lots passengers there. You need to deposit your luggage earlier. 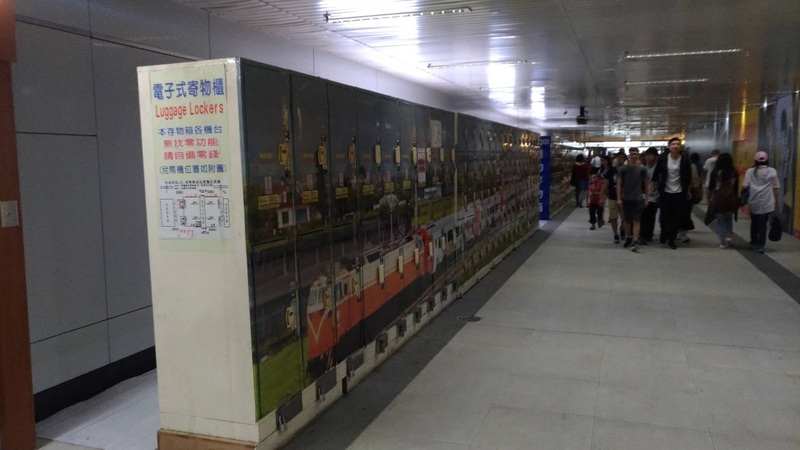 Is there a luggage store or lockers at the train station in Hualien? Also is there luggage storage in Jiaoxi Station, Yilan? A luggage storage center at Yilan Train Staton. But no luggage storage at Jiaoxi train Station. Yes. There is a luggage storage room there. Hi, thanks for the informative post. Can I check with you, at Xinwuri train station, is there a time frame in which I have to collect by luggage by? Also, can I store it there for more than 3 hours? I have a late flight from Taoyuan Airport and would like to leave my luggage there during the day while im in the city and pick it up again for flight check-in at night. Is this possible, and if so, where can I find the service in the airport? Thanks! Fin the Bonded Baggage counter. Hi, I have a super early flight arriving (5am) to Taiwan, and the hotel check-in is not until 3pm. Can I leave my 32" luggage Taipei Railway Station Baggage Station and have it pick up later in the evening? Or is the electronic locker at Taipei main station big enough to store my luggage? I think you can leave your luggage at the hotel in the early morning and come back in the evening,. Hi is the Taichung baggage station relocated? New Taichung Train Station replaced the original station since Oct 2016. The baggage center is at exit 4 of the new station. The operating hour is 08：00~20：00. There are lockers at Taipei Main Station but expensive. Hello, I will travel from Taipei to Alisan Mountain by night bus on Fri 5/26, is there any luggage storage in Alisan Forest Railway station. I am supposed to be there around 3.30am. Thanks anyway! 3. Be sure to check the midnight bus. As I know, it is not a regular bus line. For midnight bus, I heard that Kuo kuang has line on every Fri & Sat. Would appreciate if any advice can be given for luggage storage at Kaohsiung train station or HSR Zuoying as I am going to Kenting. There is a luggage storage center at Kaohsiung Train Station . Hi, i will arrive taoyuan airport in early 5am. pls kindly suggest. should i drop my luaggae at airport and go to Gloria outlet then back to airport to pick up or i should bring my luaggae to outlet? The opening hour of Gloria Outlet is at 10am~21pm. Any other purpose other than shopping? Gloria Outlet is at HSR Taoyuan Station. It is convenient there. 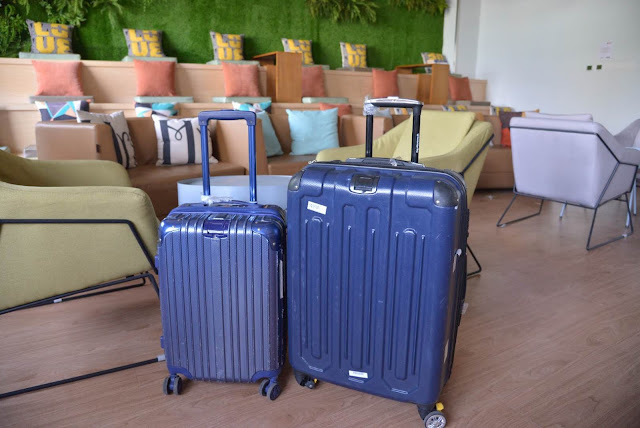 You can leave your luggage at HSR station if your luggage is not as large as 28"
Is there a 24h luggage storage at Taipei Main Station? We would like to keep our bicycle bag there for probably a week, and how much is the charges? I did get a reply from TRA, they only allow limited size of luggage and not a 24h service. But I do read from post above, there is 24h, pls help to clarify further. (1) 24h locker: on a 3-hours basis ranging around NTD 30~50. 24H may amount to NTD 240~400. we will be stay at sun moon lake for 2 nights. can we carry our luggage or we need to store our luggage at the luggage center? I don't get your points. If you will come and go back from the same place, eg Taichung, you can leave your luggage at Taichung. Hello are luggage centers open 24/7? Let me rephrase my question. Is there a luggage center that is open 24/7? I have an early flight (4am) and would not want to waste money on one more night at my hotel. Any possibility to leave the luggage at TaoYuan train HSR station for 4 days? I will be doing some cycling from Taipei to ChiaYi and return to Taipei. The HSR locker is not 24h and on NTD50/3HR base. If you want to start your cycling from Taipei, why do you leave your luggage at Taoyuan but not Taipei. I'm planning to head up to Hualien from Kenting and would be passing by Taitung to visit the Brown's Road. Is there any luggage centre / locker at chihshang station in Taitung that I can store my luggage with? There is a luggage storage center at Chishang Train Station. Hi Chen, Thank you for your help in advance. I would like to ask whether Kaohsiung or Taitung Train station can help deliver my luggage to Hualien Train station as I will be cycling for 3 days from Taitung to Hualien. If yes, how much is the delivery fees and storage for 3 days fees with Hualien TRA? Yes..You can deliver your luggage at Kaohsiung/Taitung Station. If your luggage is less than 30KG, the fare is around NTD 100. Thank you so much again Chen! If you want to go to Raohe night market for a few hours, use locker. 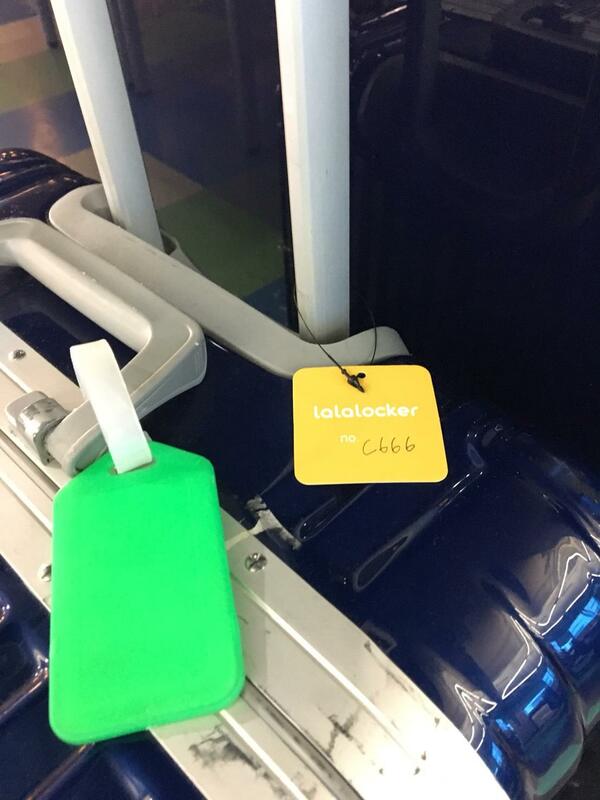 I thought luggage office n lalalocker r the same haha. Alright, i'll use lockers! thank u for ur recommendation,Chen! Hi! is the luggage office in Chiayi located at Chiayi HSR station or TRA station? or both? thanks! The luggage office is located at TRA station. Luggage box shop? or luggage storage center? You can leave your luggage at luggage center in Taichong Railway Station.About 100 m to your hotel. 08：00~20：00 NTD50~70 perday. thank you mr chen. i'll bookmarked your blog because i need more info before i arrived at taiwan next month. Hi, I read a blog, which the blogger could not store her luggage at Taipei Railway Station Baggage Center, as they can only keep the luggage for a max of 3 days. I am looking for a place to store my luggage for 4 days straight. In my experience, I have not heard that. I also checked TRA official information and asked in local railway forum and could not find such regulations. can you provide the blog? May I know if foreigners can buy the alishan forest train ticket online? I have another blog about booking Alisan Forest Train. Please use the search bar at the top with keywords "Booking Alisan Forest Train"